You've found the “U.S. Targhee Sheep Breeders” page here at Hobby Farm Wisdom! If this is the first time you have visited our site: Welcome! 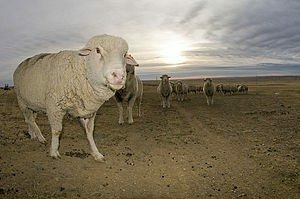 The Targhee is a relatively new breed of domestic sheep that was developed by the USDA’s Agricultural Research Service in the early 20th century. This breed was developed from Rambouillet, Corriedale and Lincoln sheep. This is a dual-purpose breed that produces a good quality meat, although today it is raised primarily for wool. The medium, heavy wool is typically ¾ fine wool and ¼ long wool, something many ranchers favor. Targhees are extremely hardy and are most popular on the western ranges, especially Montana, South Dakota and Wyoming. Mature rams weight on average 200 – 300 pounds, with ewes weighing 125 – 200 pounds. The ewes produce an average 10 - 14 pound fleece with a yield of 50 – 55%.